Ireland’s response to climate change has been “woefully inadequate” while the State is “dramatically off track” in meeting its emission reduction targets, Irish NGOs have warned. The publication by the Government of a national action plan for implementation of the UN Sustainable Development Goals (SDGs) is long overdue, according to a national alliance of more than 40 Irish social inclusion, development, environment and trade union groups and networks. 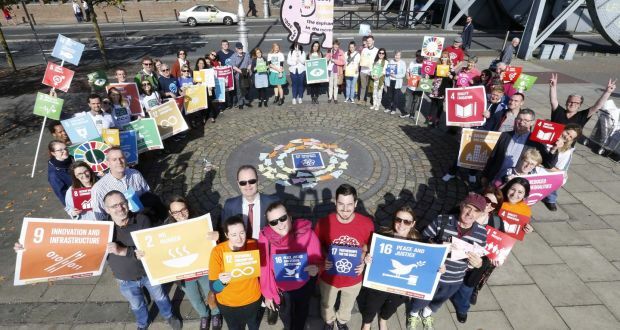 Representatives from NGOs across Ireland gathered in Dublin on Monday calling on the State to ensure it meets its commitments under the 2015 Sustainable Development Goals (SDGs), two years after the accord was signed. The Coalition 2030 alliance called for “national targets and indicators to measure our progress” at a rally and march in Dublin on Monday to mark the second anniversary of the signing of the goals in New York. You can see the video of the action in twitter.